Inbound marketing is a coordinated set of actions that are targeted, measurable, and far more cost effective than traditional marketing. Marsden Marketing is expert at transforming your digital presence into a lead-generation machine. Combining a website that attracts and nurtures buyers through each stage of their journey, targeted social media, and consistent email nurture, with the right marketing automation tools, we create a highly effective lead-gen engine. Technology is key to maximizing your marketing ROI, but it's complicated! Marsden Marketing has invested in the tools, training, and certifications for the most important marketing technologies. 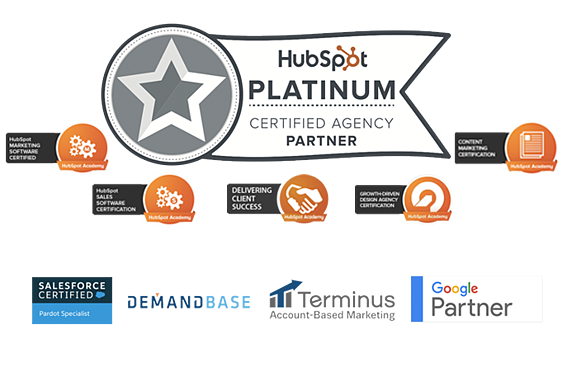 We're a HubSpot Platinum Partner, ranking us as one of the largest in the world. But we're all about the best technology for your business. That's why we work with a variety of tools and are constantly on the lookout for what's next. Our experts keep our clients' MarTech stacks humming to pull prospects in and nurture them through the sales funnel.